Most of our time was spent around the Marriott hotels, surrounding beach area and across the street at the pond near the sky diving hut. This pond gave us a look at all of the heron/egrets that we saw during our trip. 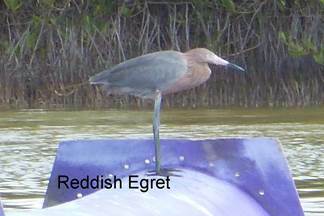 The reddish egret and tricolor heron were the highlights on the pond. The pictures aren’t the greatest due to the distance but they do identify the birds. The Bubali Bird area was unique in that we watched 5 or 6 Sora from the tower and later from the bank as they hunted in the open. Usually we are lucky if we see one of these elusive birds and usually just for a second or two as they dart out from the weeds. Here they were openly hunting on the weeds. 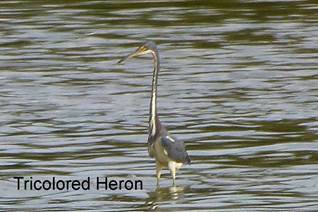 The dozen or so green herons also seemed to ignore us in their stalking. The highlight of the trip was off a gravel road between the entrance to the birding tower and LG Smith road. The gravel road is on the opposite side from the bird tower and is next to a small canal the runs under the road. 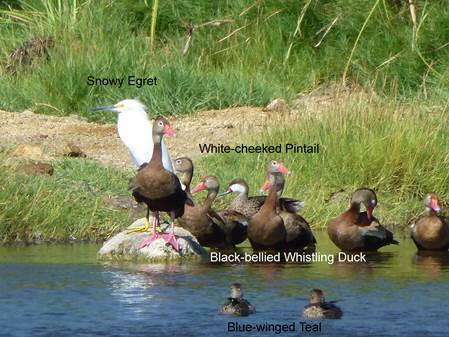 Besides the normal pintails, grebes, herons, egrets, blue-winged teals, and whimbrels were 6 or more black bellied whistling ducks. We had to go back a second time just to make sure of our identification. Next trip will include a more extensive tour of the island and birding areas.